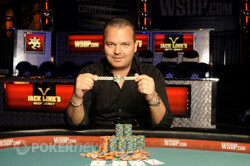 The 2012 World Series of Poker continued on Saturday with the third and final day of Event 39: $10,000 Pot-Limit Omaha. What started with 293 players was down to the final 13 at the start of the day, each looking to take down the $661,000 first-place prize. It took less than six hours to determine a winner, and that man was Germany’s Jan-Peter Jachtmann. At the start of the day, all eyes were on Andrew Brown, who began as the dominating chip leader and was looking to capture his second bracelet. He put his chips to good use, and after John Kabbaj hit the rail in 13th place, Brown scored a knockout when he managed to make two pair with on a pot against the of Adam Kornuth. A on the turn and river kept Brown in the lead and sent Kornuth home in 12th place. From there, PLO veterans Sammy Farha and Ville Wahlbeck were sent to the payout desk in 11th and 10th place respectively, before Joe Kusher followed them out in ninth place. Kushner’s deep run was due in part to a crazy hand he won on Day 1 where he eliminated four opponents! Not long after, a short-stacked Jason Mericer was all in preflop with the against the for Micah Smith. The flop gave Mercier the lead with two pair. The turn was the and then the river counterfeited Mercier when the hit. Smith's king and nines won the pot and sent the two-time gold bracelet winner to the rail in eighth place for $72,132. Brown was back at it in Level 23 when he raised to 58,000 from the cutoff seat and Benjamin Sage potted it from the button. Brown reraised and Sage called all in for approximately 310,000. The flop, turn and river ran out and Brown's three aces won the pot. Sage finished in sixth place and earned nearly $125,000. 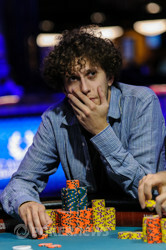 In Level 24, Brown raised to 65,000 from the cutoff, Andy Seth potted from the button to 240,000. Brown made the call and then led out for a pot-sized bet on the flop. Seth decided it was time and moved all in for right around 530,000, and Brown made the call. Seth was ahead with kings when the chips went in, but the turn delivered Brown two pair. Much to Seth's dismay, the river would give his opponent a full house and send him to the payout desk in fifth place, good for $165,665. Next to go was a short-stacked Smith, who raised to 105,000 from the cutoff and received a call from Jachtmann. The flop saw Jachtmann lead out and Smith called off his remaining 115,000. Smith was ahead with two pair, but the turn counterfeited him by giving Jachtmann jacks and deuces. The river was of no consequence and Smith took his leave in fourth place. Brown scored another elimination when he limped in the small blind and Steven Silverman exercised his option in the big with a raise to 90,000. Brown called and then checked the flop, prompting Silverman to bet 125,000. Brown immediately announced a pot-sized raise, and Silverman called off for right around 540,000. Brown had flopped a pair of eights with a flush draw, while Silverman held a pair of queens, a wrap, and an inferior flush draw. With draws abound, it was a bit surprising that it'd be the on the turn that would give Brown the lead. Even so, Silverman still had plenty of outs to stay alive on the river. Unfortunately for him, the was not one of them. 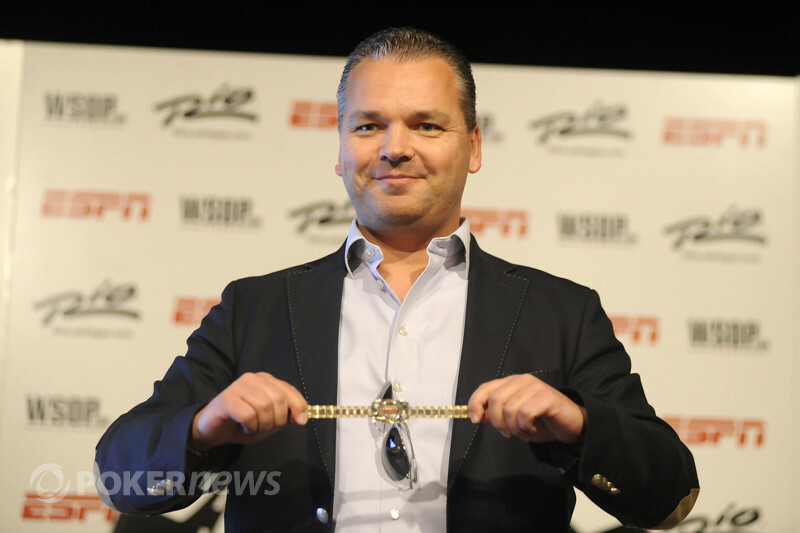 Heads-up play began with Jachtmann holding 4.94 million to Brown’s 3.85 million. While the chip counts were close, it didn’t take long to determine a winner. The final hand came when Brown raised to 80,000 from the button and Jachtmann made the call. The flop saw Jachtmann check, opening the door for Brown to fire out 160,000. Jachtmann then woke up with a check-raise to 640,000, Brown called, and the rolled off on the turn. Jachtmann led out for 1.1 million and then called when Brown moved all in. Brown was ahead with top set, but Jachtmann held a wrap. Brown also held a flush draw which detracted from Jachtmann's outs, but it was for naught as the spiked on the river to give the man from Germany the straight. 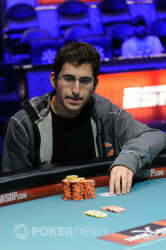 With that, Brown was denied his second WSOP bracelet and dispatched in second place, good for $408,393. That does it for our coverage from Event #39 $10,000 Pot Limit Omaha, but there are still plenty of tournament happening daily at the WSOP. Be sure to check out our Live Reporting section to see which ones are happening now. Andrew Brown raised to 80,000 from the button and Jan-Peter Jachtmann made the call. The flop saw Jachtmann check, opening the door for Brown to fire out 160,000. Jachtmann then woke up with a check-raise to 640,000, Brown called, and the rolled off on the turn. Jan-Peter Jachtmann limped on the button and Andrew Brown checked his option from the big blind. Both players checked the flop before Brown led out for 60,000 on the turn. Jachtmann made the call and then both players returned to checking on the river. Jachtmann rolled over and it was good as Brown mucked. Action folded to Andrew Brown in the small blind and he limped. Steven Silverman was in the big blind and opted to exercise his option with a raise to 90,000, which Brown called. When the flop fell and Brown checked, Silverman came out with a bet of 125,000. Brown immediately announced a pot-sized raise, and Silverman called off for right around 540,000.